Hello dear loyal readers again! I didn't really plan for another review as I was busy with my trip but this place is worth a try. Yaw's Roast & Grill is dad's friend's brother's restaurant. The homely style is similar to 43 Cafe. It has a very cozy rain forest themed environment right in the gardens of the owner's home and everything is prepared in his own kitchen. How homecook can it get? Dad also says it used to be known as Top Top. Located in a housing area behind Midlands, you can either park in the mall and walk across or you can park within the housing area but you need to pandai-pandai find parking lah. It's a very affordable place to dine despite slight change in pricing since November this year. We were served complimentary garlic bread. Generous amount of butter but not enough garlic. Oxtail soup (RM12.50) is a must for me whenever I see it in menu. It's kinda hard to find a decent western style oxtail soup that is not the mamak style sup ekor in Penang. Used to regularly order oxtail soup at James Foo before they moved and don't serve it anymore. So happy when I found this one! Silently hope the mug might be larger. Overall the consistency is perfectly thick and the taste is up to my expectation like what an oxtail soup is supposed to taste; rich in spices and natural flavour. 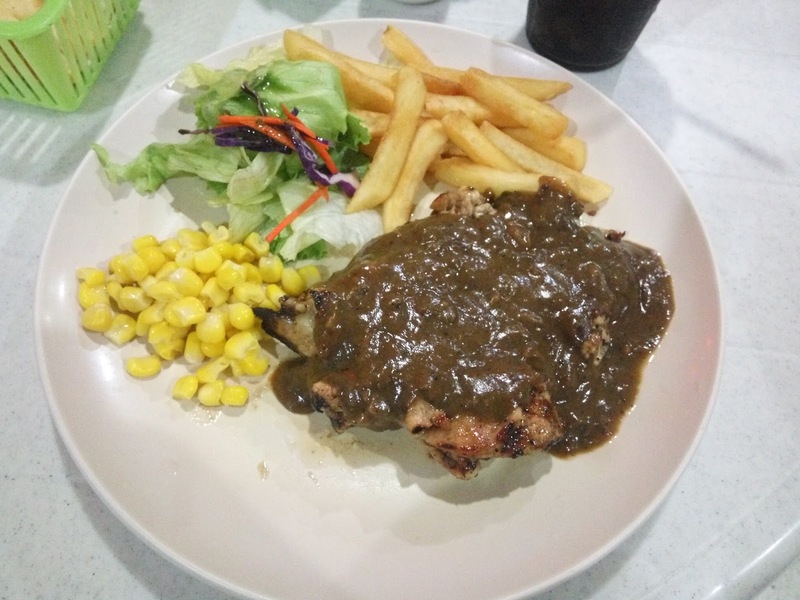 Both mum and I ordered normal chicken chop (RM10.50). Mum told me the difference is that the sauce of Hainanese Chicken Chop contains onions, mushrooms and green peas but cost an extra RM5 so she recommended me to order the normal one instead. Hubby ordered their BBQ chicken (RM13.50). It has a sweet and sour tangy taste. Birthday treat by my parents for hubby and I. Sagis rock! Evening view of the cafe. The cafe is located at a corner house with lotsa greens. You can park outside of their entrance too. So would we come again? For sure! I need to try their signature chicken pie and Barbeque pork ribs after eyeing on a huge plate of ribs on the table next to ours. UPDATE: After few weeks we went again for dinner. 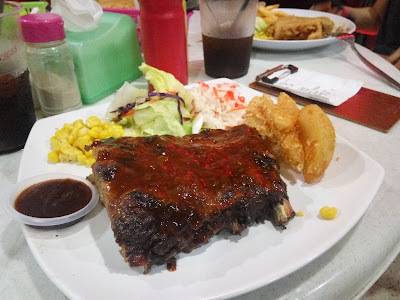 Hubby ordered black pepper chicken while I had half BBQ Pork Ribs at only RM28 which is far worth it than Morganfield's. The meat so tender and juicy and alot of sauce. Address: 1, Gerbang Midlands, George Town, 10250 George Town, Penang.